n the sleepy Ohio town of Niles, brothers Alfred and Charles Harris owned a small jewelry store. The year was 1890, and after several blunders, including an ill-fated attempt inventing an automatic nail-feeder, both swore off any more financial fiascos. The 1972 book The Harris Story tells us what happened next. It seems Charles couldn’t help himself when he got to talking to the next-door neighbour — the owner of the Niles Independent newspaper. Mr. Smith boasted he had just purchased a new state-of-the-art cylinder printing press that was still fed by a boy. “You mean you’ve actually got to feed that press by hand?” exclaimed Charles. “Of course, but I can feed 25 sheets a minute,” said Smith. Unimpressed, Charles shot back, “No wonder you haven’t finished our handbills.” “Well, if you’re so damned smart, why don’t you build one,” Smith shouted back. Alfred was more methodical compared to Charles, and he returned from Chicago with a lot of notes and sketches. This was when they also made another monumental decision to not only construct the feeder but also design a brand-new FAST printing press. This had to be revolutionary, for the Harris brothers were witness to the lethargic speeds and excessive manpower needed to print anything. 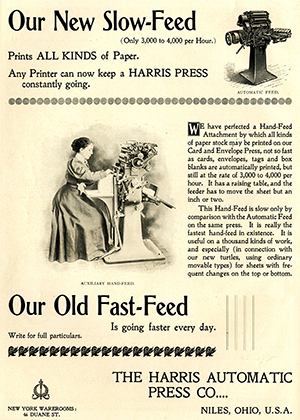 Harris would create a printing press no longer inhibited with a flatbed. The concept they came up with was a revelation. The machinery of this era was either platen (hand-fed) or cylinder with reciprocating beds — slow as molasses. Bed machines wasted so much energy having to stop and return. Rotational designs could run incredibly fast with less moving parts and even less energy. Today’s offset presses are a prime example of the rotary principle. There would be no limit on how fast they could go, provided the press had an automatic feeder. E.C. Fuller and Dexter were already experimenting with feeders using negative air via a piston pump but Harris would do it all without any air, and for the first time, on a printing press automatically. 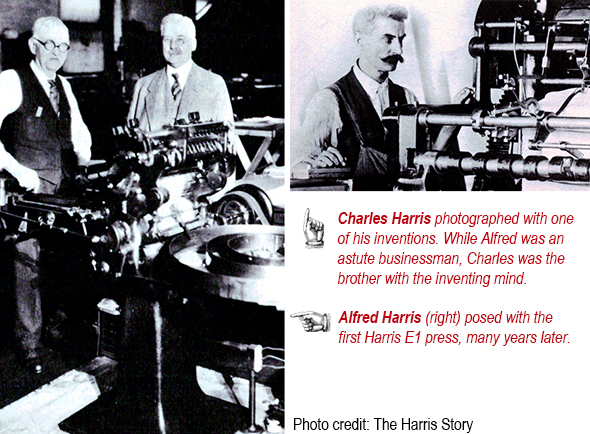 In late December 1895, the Harris Automatic Press Company was incorporated. The fledgling affair was relocated to two rooms of the clapboard house where President William McKinley was born. On a spring night in 1896, a group of men huddled around a lamp-lit contraption and watched as Charles threw the drive belt onto a pulley. The damn thing worked! On subsequent calls, laughter didn’t subside even when Charles started to roll back the claim. Now he was telling folks 12,000 impressions per hour. Dejected, Charles returned to Niles. “We may starve to death in a gold mine. Cut it to 5,000 per hour.” At this point the brothers reluctantly agreed to modify the press without the watershed automatic feeder, turning it into a hand-fed press! Harris would now offer two versions of the E1. Finally a prospect — Brooks Printing in Cleveland, Ohio. Brooks would later be purchased by Bowne and eventually closed in 2011. The two Brooks brothers promised an order if Harris would put on a demonstration of the E1 running 5,000 per hour. Plus, they wanted Harris to pay for any wasted stock and keep the sale secret for six months. While Alfred contemplated the offer, Charles readily accepted, “Agreed!” On the press’s arrival, Charles struggled to set it up. There was a 12,500 run of government postcards waiting. Finally, it was show time. The cards were flying out so fast, one of the owners hurried to call in his brother. Minutes later they both came back to discover over half of the run was finished. “How fast is that press running?” asked Brooks. “About fourteen thousand an hour,” the brothers replied. “I thought you said it would do five thousand an hour!” Shocked beyond belief, Brooks forgot about the exclusivity agreement and ran off to get two competitors who happened to be visiting their office. History was made that day. Continual improvements were made to the E1 over the next few years including attachments to feed multiple-up tags, die-cut paper box blanks, and paper bags. One unusual modification allowed the feeding of milk bottle (round) stoppers. Harris devised a second unit for numbering and perforating in one pass. But all was not well at Harris; strange things were occurring to their presses. Parts would mysteriously fall off, nails somehow fell from the ceiling and emery dust would find its way into the bushings on a lot of the sold presses. Sabotage was a worry — this revolutionary press had pressman, and especially feeders, fearing they’d be out of a job. The Harris boys screamed: it was so obvious the E1 would not only run like a banshee but eliminate gang-runs and multiple-ups on larger sheets. The savings on composition was mouth-watering. One-up on the ‘Little Wonder’ equaled eight-up on a cylinder — wake up printerdom! It wasn’t long before two roadblocks percolated to the surface with the E1. First, it could only feed substrates with a minimum thickness of .009 inches. This was soon solved in 1900 with a new feeder that was specifically adaptable for thin paper. But by far the biggest hurdle was something neither Harris brother considered — few of their customers used or had the equipment to make Stereos or copper Electros. Stereos were developed in the early 1800s and were a lead plate made from a Flong mat mold of foundry type. Large shops and large web/newspapers had the casters for this revolutionary plate but small-town printers, notoriously cheap, would not invest in casters, shavers, and routers. Without plates, the E1 was useless. Harris started offering equipment for plate-making as well as a curving device for electros. But that meant more money when the industry was still haunted by the Panic of 1893 depression. Back at the Niles factory, the Harris brothers fashioned together a crude ‘type box’ which would replace the plate cylinder and hold normal foundry type. But with the E1 cranking out at 15,000, the type would jar loose and spray out like a burst steam pipe. The type box wasn’t a success and created the biggest downfall in massive sales to jobbing printers. Regardless, spurred by some early E1 successes, Harris built a larger press in 1897 called the S1, or ‘Big Brother.’ The press would feed carton and paper with a larger sheet size of 16 x 20 inches. The S1 was almost as fast as the E1 too. In fact, a confidential company specification sheet notes that the E1 could even reach 18,000 sheets per hour. All told, Harris would build just 617 E1’s (1896-1932) and 449 S1 and S2’s (1897-1926) before ending production. The S1 would open up an even bigger door when in 1904, Harris happened upon the magic of offset. During an installation of an E1 at the Enterprise Printing Company in Cleveland, Alfred would be witness to a commotion between a pressman and feeder girl over her misfeeding a sheet on a lithographic stone press. On examination, Harris noticed how much sharper the reversed image was compared to what was printed directly from the stone. Harris hurried back and by 1905, had modified the S1 with an additional blanket cylinder to become its first offset press: model S4L (L for litho). At the time Harris employed a German immigrant named Casper Hermann. Having arrived from Königsberg, Germany, in 1889, Hermann bounced around print shops in Baltimore and Richmond before ending up in Niles. Being witness to the new letterpress/offset S1, Hermann returned to Germany in 1907 where he would become the first German to build what was a copy of the Harris offset press – the Triumpf. Germany’s first offset press was a Harris! I only saw one Harris E1, and that was in 1982. I didn’t know what it was and was quite surprised to learn Harris ever made letterpresses. This ‘Little Wonder’ fascinated me. How could it be that such a trailblazing design had been forgotten in time? During the last few years, I tried to find another. Luckily I did, but in terrible shape. Out of the blue, I received a call from Richard Foley from Dayton. He had worked for Harris-Intertype and was a fountain of knowledge. He connected me with the Smithsonian Institution in Washington, who not only had the oldest E1 (in storage) but all the early records of the Harris Automatic Press Company. I spent two days rifling through documentation and original parts drawings, all drawn in ink on fabric. The museum was very gracious and is a big reason why today we have restored #259 manufactured in 1899. We’ll be printing on it too! A recreation of a Harris postcard franked in 1898 at Niles. The press doesn’t have any ball bearings or a vacuum pump. All it needs is a ½ HP drive motor. There are only five taper pins — everything else is keyed with set screws. The ‘Wobble Gear’ for oscillation of the inker drum started with this E1 as did patented feed-rolls for sheet register. The press could be tripped off impression if it missed a sheet — unheard of then, taken for granted today. All of these Harris construction methods remained to the very last Redaelli Tecna Offset Aurelia that rolled off the line around 1996. Harris had sold off its sheetfed offset business to the Italians in 1975. The shuttle feeder remains the real piece of brilliance. If you have a mailing department, take a look at the feeder. That device is thanks to Harris. Today’s manufacturers – Morgana, Kirk-Rudy, Sitma, Buhrs, and Cheshire to name a few – use the Harris principle top-load-bottom-feed device. 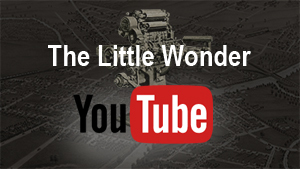 Groundbreaking as the ‘Little Wonder’ was, even though being proven, it still attracted naysayers and killjoys. Today’s current environment shows not much has changed since 1896; we often refuse to open our eyes to new technologies even when they are staring right back at us. Harris would enter electronics in the 1950s and are now L3 Harris Technologies Inc., with sales of US$16 billion dollars — all with fond respect for the two jewelers in Niles who started it all. A special thank you to Richard Foley, Harris, and Joan Boudreau, curator of the Graphic Arts Collection, National Museum of American History, Smithsonian Institution, Washington. She was patient and instrumental in assisting us in bringing back a part of print’s history.